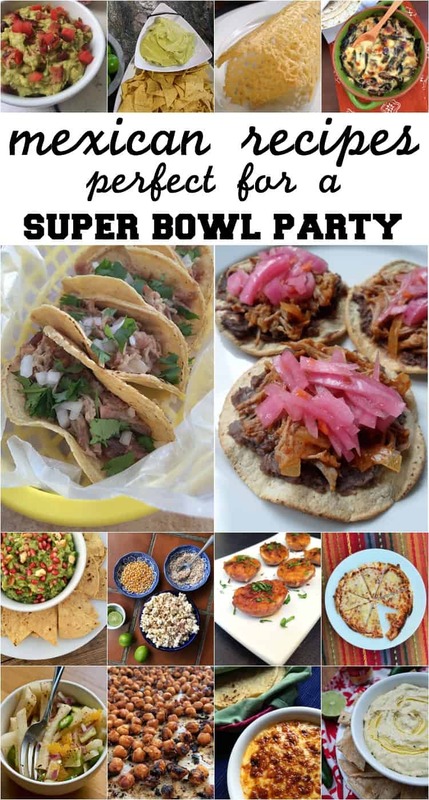 Super Bowl Sunday is upon us, and whether you’re throwing your own fiesta or heading to someone else’s, you probably need to make at least one dish to share with everyone! Why not feed your crowd with an assortment of Mexican snacks? Here’s my list of 20 Super Bowl-approved snacks — easy Mexican recipes that can either be prepared a day ahead of time or quickly before you head out to watch the big game on someone else’s couch. An ideal dish to make the day before; serve this slow-cooker cochinita pibil buffet-style with black refried beans and hearty tortilla chips or mini tostadas. Another ideal dish to make the day before, you can serve slow-cooker carnitas as tacos with garnishes, sliders with chipotle mayo, or it would be a great addition to any DIY nacho bar, too! No matter what kind of guacamole you make, be sure to read my guide on how to keep your guacamole fresh and green if you plan to make your guac in advance or store leftovers after the party! My No. 1 most-requested recipe any time I’m invited anywhere when guacamole needs to be part of the menu. This version of the classic won’t let you down! Bacon, lettuce, and tomato give a classic guacamole a uniquely American twist. This one is best to make the day of so the lettuce and bacon stay crisp. This sweet spin on a usually savory dish is sure to please your crowd! This can be made the day before or the day of the party. Another fruity spin on guacamole, acidic pineapple and sweet pomegranate seeds pair well with classic guacamole flavors. Crispy cotija cheese croutons and pomegranate seeds give this guac an excellent salty and sweet crunch! Fry up some chorizo (which you can also do the day before, so your kitchen doesn’t stink) and mix in to grated cheese. Melt in the oven under the broiler for an awesome snack you can serve with chips or mini tortillas. Mushrooms and strips of roasted poblano chiles are excellent mix-ins so your vegetarian friends can enjoy the queso fundido, too. Serve with hearty chips or mini tortillas. Making your own hummus from scratch is super easy! Add Mexican flavor to it with roasted chiles. You could also sub chile poblano, serrano or chipotles en adobo to make your own unique, spicy hummus! Serve with tortilla chips or pita bread for dipping. A cousin to guacamole, guacahummus is made of regular hummus blended with avocado. This is a great semi-homemade hack that you can make in less than 10 minutes with store-bought hummus! Buy your chicharrones and whip up a quick salsa verde fresca for a healthy, flavorful dip to go with this sinful snack. For a healthy snack to nosh on during the game, these oven-roasted chickpeas will hit the spot. You can make these the day before or the day of the game. These palomitas are awesome served with a squeeze of lime juice on top! Best to make right before the party and let guests add the toppings as they serve themselves – just pop the popcorn for them and set out the cheese, chile powder and limes, and they do the rest. With store-bought puff pastry dough, the sky’s the limit with choosing your own fillings for these quick empanadas. Thaw the dough for an hour in advance, then stuff with fillings such as jamón y queso, Spanish chorizo and cheese, or veggies and cheese. You can bake them a few hours beforehand if you like and just reheat in the oven to melt the cheese later. Similar to potato skins, these uniquely Mexican-flavored mini potato bites are filled with a mixture of chorizo, crema mexicana, adobo sauce and cheese, and baked to bubbly perfection. If you’ve ever been to a taquería in Mexico City, you’re probably pretty familiar with this typical Mexican appetizer of crunchy, crispy cheese. The secret’s all in the shredded gouda. Using flour tortillas as a base, mix your own sauce blend with canned tomato sauce, chipotles in adobo and Mexican oregano. Top with your favorite shredded Mexican cheese and bake or stick under the broiler for a quick and easy Mexican pizza treat. Fry up these puffy wheat snacks and dress with your favorite salsa botanera (such as Búfalo, Valentina or Cholula) and freshly-squeezed lime juice. This healthy salad made with jicama, oranges, lime juice, red onion, serrano chile, cucumber and Tajín is great if you’re trying to watch what you eat or for vegetarian or vegan guests at your Super Bowl party. This popular street food is easy to make in advance and divide into small party cups. To save yourself some prep time, buy frozen roasted corn (I like Trader Joe’s brand) or frozen corn that you roast in the oven yourself.